Download and install Titus and Numpy. This article was tested with Titus 0.8.2 and Numpy 1.8.2; newer versions should work with no modification. Python >= 2.6 and < 3.0 is required. Download the MPG dataset. This is a tab-separated values file in which the first line contains field names. Learn about categorical and regression trees (CART) if you’re not already familiar with it. Tree learning is applicable to many different types of data— continuous and categorical predictors, continuous and categorical predictands, even structured predictands like vectors (beyond the scope of this tutorial, but not beyond the scope of PFA). Titus has a cart.Dataset class to codify this structure, and our first task will be to put the input data in this structure. Start by defining the field names, field order, and field types for the scoring engine’s input. 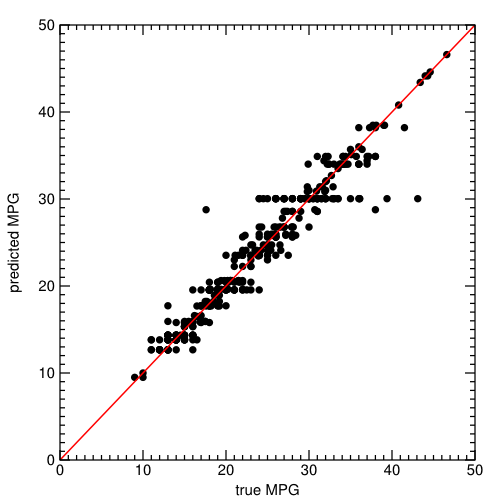 The scoring engine does not include the “mpg” field (because it’s supposed to predict that!) or the “carType” (which is unique for each data entry). We’ll express this list of fields using Avro, so that we don’t have to redefine it later. Now we declare the tree using this dataset (fromWholeDataset means that the predictand, “mpg”, is one of the fields in dataset and should not be used for prediction; the unnamed constructor assumes the dataset contains predictors only and takes the predictand from another source). The tree has been declared, but it currently contains only one node, a single leaf pointing to all of the data. To perform tree-based learning, we must recursively split the data in such a way as to maximize a gain term. The default gain terms are given by the following methods of the cart.TreeNode class, which can be overridden by a subclass. The stopping condition, which tells Titus when to stop splitting tree nodes, is given by a user-supplied function of node and depth. The tree is complete. You can now create PFA from it, either using pfaDocument to get a complete scoring engine or pfaValue to get a partial document, for use with customized preprocessing. To do a quick test, we can create a scoring engine in Titus and run the predictor. The fact that the model reproduces the training data is not sufficient for a real data analysis (cross-validate! ), but it’s enough for this simple example. To get a sense of whether we’ve overtrained, compute some basic features of the tree itself (number of leaves « training set size is a good start). # what's the tree's complexity (number of leaves, depth, etc)? # which fields are split on, and how often?